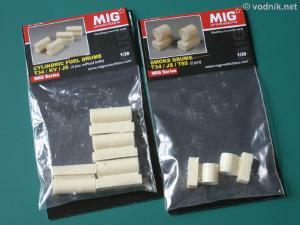 Two small detail sets from MIG Productions contain fuel and smoke drums for Russian tanks in 1/35 scale. Both sets come in plastic zip-bags with thick paper flap stapled to them. No instruction sheets are provided. 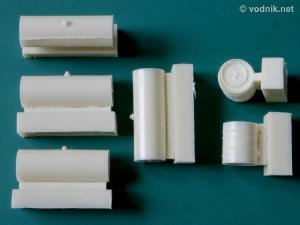 Set MP 35-132 contains four cylindrical fuel drums which can be used with T-34, KV and JS tanks. Drum dimensions are: diameter = 9.7 mm and length = 28.6 mm. Each drum has two handles molded on each end of it and a filler cap on the middle. There is a weld seam along each tank and it seems to be a bit overdone - some toning it down with sandpaper would improve its appearance. No retaining belts are molded on drums and information on MIG website clearly suggest using ABER and Eduard photoetched sets as a source of belts. The use of resin drums in conjunction with these PE sets saves a modeler some work, which would otherwise be needed to remove molded on belt details from plastic kit parts. Set MP 35-133 contains just two parts - smoke drums which, according to MIG website, can be used for early T-55 tanks or late T-34 and JSIII tanks. Drum dimensions are: diameter = 11.1 mm and length = 12.7 mm. Drums have nice and crisp handle and ribbing details molded on them. Molding quality is very good, with no air bubbles and no flash. Resin pouring blocks have relatively small contact area with parts, so should be easy to remove. Contents of both sets. Four fuel drums on the left and two smoke drums on the right. Two described sets from MIG Productions are easy to use and very well made. I'm sure many modelers building Russian armor will find them highly useful for their projects.